WATERVILLE – The Northeast Delta Dental Foundation generously awarded a grant in the amount of $7,000 to HealthReach Community Health Centers for support of the Dental Outreach Program in area schools. Two of HealthReach’s 11 practices, Bingham and Strong Area Health Centers offer family dentistry. In addition, Bethel Family Health Center provides pediatric hygienist services. In 2017, 3,612 patients received 7,244 oral health visits at HealthReach practices. The dental centers provide comprehensive oral health services to people of all ages in the dentally underserved communities of Western Maine. Private insurance and MaineCare are accepted and a sliding fee scale is offered to eligible patients (based on family size and income). In addition to providing oral health services to patients, dental staff are committed to community education and prevention initiatives. Rural school systems in Maine have decreasing financial resources to support non-core programs, but the schools and area families value programs geared towards improving community health. Currently, one HealthReach hygienist offers dental health education in three school districts. 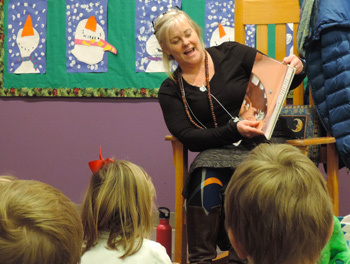 In two Franklin County school systems, Flagstaff RSU and MSAD #58, she works with pre-K - 12th graders. In Oxford County, she offers oral health classes to second graders. “We are pleased to support HealthReach’s outreach efforts in area schools to increase access to important oral health education. We know that having a clear understanding of the importance of healthy dental habits from an early age, like brushing and flossing, helps create a lifetime of healthy smiles,” said Kathleen B. Walker, APR, Treasurer of the Northeast Delta Dental Foundation and Director of Marketing & Communications at Northeast Delta Dental. Sharon Smith-Bouchard, IPDH, has been with Strong Dental since it opened in 2002. She has offered dental education in local schools since she began practicing as a hygienist 32 years ago. Over the years, Sharon has developed plenty of activities to engage students of all ages and encourages them to share their learning with friends and family. From teaching proper brushing and flossing techniques, to explaining how their favorite snacks and beverages affect their teeth, Sharon is unmatched when it comes to connecting with kids and it is one of her favorite things to do.